NASA on Thursday revealed astronomers have discovered what appears to be Jupiter's doppelgänger. 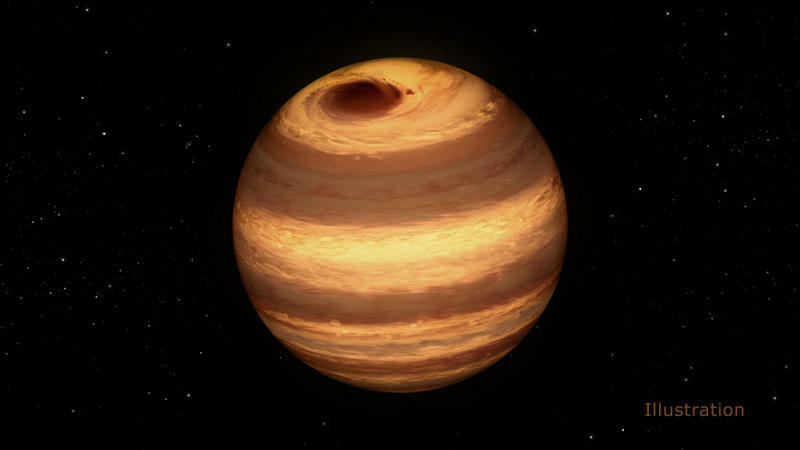 Using data from NASA's Spitzer and Kepler space telescopes, the star, about the size of Jupiter, features a cloudy storm similar to our neighbor's Great Red Spot. Scientists say the star's beauty mark is at least two years old, but probably older. The star, dubbed W1906+40, is known as an L-dwarf, which fuses atoms and generates light, similar to our sun; other suns are sometimes referred to as brown dwarfs, or "failed stars." W1906+40 is estimated to feature a temperature of about 3,500 degrees Fahrenheit, which is actually relatively cool for a star. In fact, it's so cool that clouds can form in its atmosphere. The cloudy storm, which rotates around the distant star once every 9 hours, is so big it can hold about three Earths, giving you an example of the immense scale. "We don't know if this kind of star storm is unique or common, and we don't [know] why it persists for so long," said John Gizis of the University of Delaware, Newark. NASA aims to use the data to search for other stormy stars in the future, and hopefully learn more about why they occur. As for Jupiter, the planet's Great Red Spot has actually been shrinking over the past few decades, though scientists aren't really sure why. You can see an artist's illustration of star W1906+40 above.